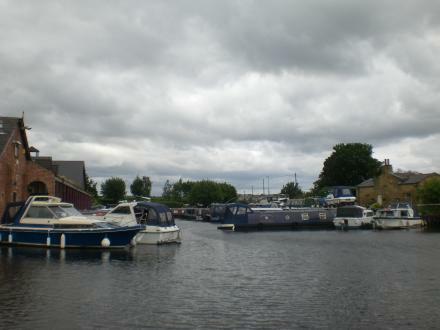 Stanley Ferry Marina is a place on the waterways minor waterways place place on the waterways major waterways place village town city on the Aire and Calder Navigation (Wakefield Section) between Fall Ing Junction (Junction of the Calder and Hebble Navigation and the Aire and Calder Navigation (Wakefield Section)) (2 miles and 4¼ furlongs and 1 lock to the southwest) and Stanley Ferry Aqueduct (This is a pair of Aqueducts over the River Calder) (½ furlongs to the north). The nearest place in the direction of Fall Ing Junction is The Stanley Ferry PH (Fayre & Square pub and restaurant); ¼ furlongs away. The place is a Marina and a Slipway. 80 Lime Pit Lane, Stanley, WF3 4DF — 1402 yards to the northwest. Ferry Lane, Stanley, Wakefield, WF3 4 — 55 yards to the west. Ferry Lane, Stanley, Stanley, WF3 4LT — 57 yards to the west. 116 Aberford Road Stanley, Wakefield, WF3 4 — 1247 yards to the west. 434 Aberford Road, Stanley, WF3 4 — 1619 yards to the north. Outwood, Wakefield — 1520 yards to the west. 1520 yards to the west. Wakefield — 1520 yards to the west. Aberford Road, Stanley, WF3 4JP — 1490 yards to the northwest. Dent Drive, Wakefield, WF1 4JG — 1533 yards to the southwest. ash grove, Wakefield, WF3 4JY — 1072 yards to the west. Wakefield — 1485 yards to the northwest. Brockadale Alpaca Stud, Jacksons Lane,Wentbridge, Pontefract, WF8 3HZ — 1520 yards to the west. Wakefield — 1457 yards to the southwest. Wakefield — 1254 yards to the north. 154 Aberford Road, Stanley, Wakefield, WF3 4NP — 1138 yards to the west. Netherton, Wakefield, WF4 — 1520 yards to the west. Tingley, Wakefield, WF3 — 1520 yards to the west. Avondale Way, Wakefield, WF2 7QU — 1520 yards to the west. Stanley, Wakefield — 1423 yards to the northwest. Stanley — 1520 yards to the west. Newmillerdam, Wakefield — 1520 yards to the west. daw green avenue, Wakefield, WF4 — 1520 yards to the west. Leeds, PRIVATE — 1520 yards to the west. Manor Crest, Wakefield, WF4 3FD — 1520 yards to the west. Park Lodge Lane, Wakefield, WF1 4HY — 1520 yards to the west. Leeds — 1520 yards to the west. Stanley Ferry Bridge, Ferry Lane, Stanley, WF3 4LT — 55 yards to the west. Wakefield, 00000 — 1520 yards to the west. Birkwood Road, Altofts,, Wakefield, WF3 4LZ — 696 yards to the east.